As per Forbes, the average age of a fortune 500 company was around 75 years in 1955; today it is less than 15 years. It is declining steadily. Companies cannot go on for long periods without innovating or adding value to their customers. Disruption is the new normal now. Businesses are looking for levers for maximising opportunities for innovation; improve customer service, increase growth, efficiency & profits. Technology is an enabler to achieve these. The marketplace is changing very fast. It is changing every day; consumers are empowered with new products that have better capabilities than before. Companies that resist changes and are slow to adapt are finding it harder to survive. Companies which are taking advantage of latest technological trends to move ahead with vibrancy and dynamism are winning. Others are struggling to keep pace. One of the major hurdles for corporations is doing away with legacy software. These systems are failing to keep up with latest technological trends. They make things complicated. 1. Your software is not solving your day to day business problems. It is making things complex. 2. The ROI from your products is not well defined. 3. You are making lot of payments to the companies, but the results are not worth it. 4. You are unable to use the latest stuff, upgrades are painful. 5. For every trivial change, you need to hire a consultant. Things take time. 6. You cannot have the information you want. When things change, it gets increasingly complex to manage it through software. 7. You’ve spent a huge amount of money & time on the consultants. 8. The software doesn’t work on mobile devices. 10. No insights or analytics for business. The whole thing is overwhelmingly complex & requires experts all the time. 1. Add Value : Optimise business processes to add value to an organisations primary products and services. 2. Customised & Tailor Made : One size doesn’t fit all. Softwares tailored to the needs of an organisation and customized as per best practices help to improve operations. 3. Design : A user centric design can make things easy for everyone. Whether it is the employees or customers, they will all benefit from great user experience of your products & services. 4. Flexible & Dynamic : The nature of business is dynamic. Whether it is reporting or the functionality, things should be dynamically customisable or configured without fuss. 5. Analytics & Insights : The world is driven by data and insights. 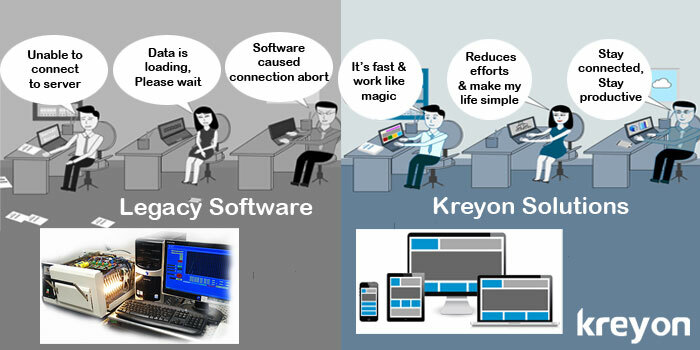 The software is now at the forefront when it comes to making key decisions. 6. Mobility : The millennial workers are all connected with smart mobiles and other devices. They should be able to do their work from the location and time of their choice too. 7. Seamless Upgrades : The upgrades to newer versions shouldn’t affect users. The updates should be transparent and seamless so that business is not disrupted. 8. Tangible ROI : A software must provide tangible ROI for a business. The value must be articulated in measurable terms for its impact. 9. Security : The information access, user data and all transactions for business must be kept highly secured. Use of best in class security standards & compliance is a must. 10. Solve Problems : Businesses are looking to invest in solutions not softwares. The primary aim of technology is to, offer solutions to customer’s pain points, make things more efficient & offer real value. Top organisations stay in touch with the latest happenings in the market place. They constantly evolve their products and services to offer value for their customers. Companies use software as a transformation tool for measuring things that matter the most, solving problems and staying ahead of the competition.